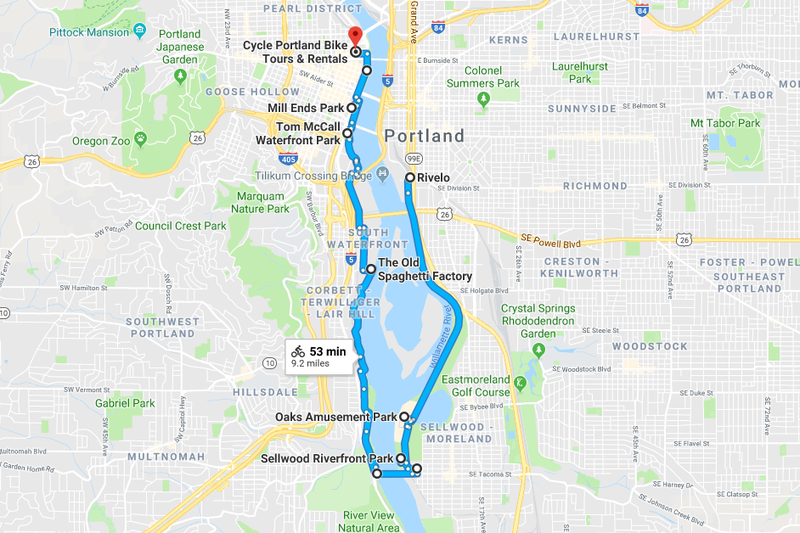 The Springwater trail/West Bank Esplanade/Eastbank Esplanade 11 mile loop is everything a bike ride should be: Beautiful, calming, energizing, fun, and full of surprises. Last summer, a portion of this route was closed for most of the year last year. Now, I am glad to say that the Springwater Trail bike ride is back. Beginning the ride, Rivelo is as good a place as any to start. It is a bike shop/ record store that only sells Bob Dylan LPs. Additionally, it’s located just two blocks from the North Entrance to the Springwater Trail bike ride. Rivelo is the perfect place to browse around while awaiting the rest of the bike crew to assemble. I find it better to ride the loop in a clockwise direction, but I can’t really say why. Perhaps this is because you can better appreciate Ross Island as you approach from the North. Kayakers, paddle boarders and boaters floating along the Willamette always add to the scene. As do the birds. There are like, Hella birds. Herons, hawks, grebs. I saw a Bald Eagle once (I swear!). And you will see all of this in the first mile. Riding the trail last spring, I was confused by what I thought was snow. Turns out it was just the floating cottonwood seeds creating a whimsical atmosphere. (I make a game of trying to catch them as I cycle by. It’s harder than it sounds.) Although I’ve seen it many times, I’m always surprised when I look left and see the bird mural on a bluff overlooking a little lake. Learning that the mural, said to be one of the largest hand painted murals in the USA, is also on a mausoleum, only makes it that much cooler. Biggest or not, it is beautiful. As is the mile hike it takes to reach it. Or so I’ve been told. A friend and I once locked our bikes to a tree and tried to find the trail that leads to it, but got lost. We had fun though. When I’m feeling festive, I stop for a bit at the Oaks Amusement Park. For the roller skating or bumper cars (if I need to work off some aggression), but usually just for the funnel cake. Even when I don’t stop, just seeing kids on rides, smelling the foods, and the general carnival atmosphere puts a smile on my face. The park has been open for over 100 years, so it must be doing something right. From there, it’s only another mile or so to Sellwood RiverfrontPark. Stopping here is mandatory. Especially if you brought anything for a picnic for your Springwater Trail bike ride. 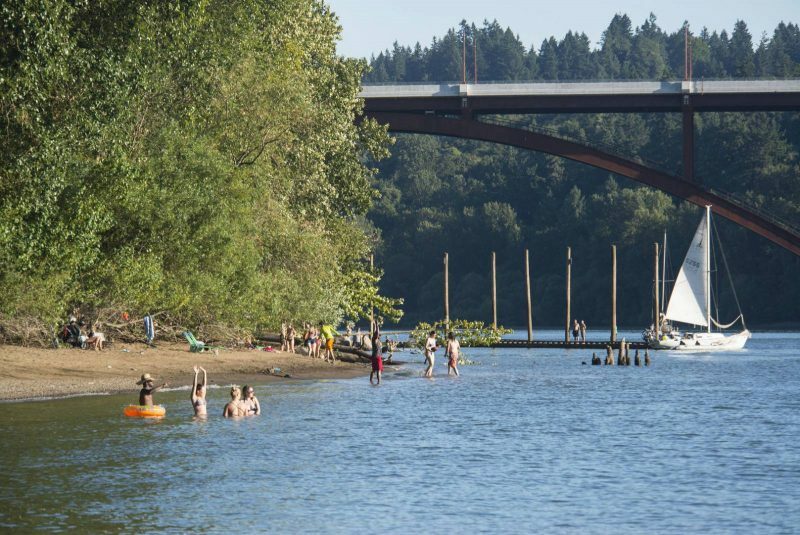 In Summer the beach is filled with people splashing in the Willamette River, dogs running around, and live music some nights. It’s also a great place to launch a kayak. (I’ve yet to figure out a good way to tow a kayak on a bike, but I am pretty good at convincing Kayak friends to bring an extra one and meet me there.) Other times, I’ll just lay back and watch the boats pass back and forth underneath the Sellwood Bridge. Sellwood Bridge over swimmers in the Willamette. Next, cross to the West Bank. It’s two blocks up, a right on 6th, then a quick right on Tacoma Street. To get to the Sellwood. Rebuilt in 2016 to be more bike and pedestrian friendly, this is now an awesome bridge to cycle across. I love the views and the plaques with interesting info on the history of Portland and the indigenous communities that lived here for thousands of years. On the other side, head north through more parks, houseboat communities, awesome river views, and sailing clubs, until you reach the Old Spaghetti Factory. The waterfront trail ends here, so you leave the river behind for the bike lanes on Bond and Moody ave through the high rise condos and under the OHSU aerial tram of the South Waterfront District. Before you know it, you reach Tom McCall Waterfront park for more leisurely river view riding. The promenade is nice for slow riding, but if it gets too crowded I like to take the two lane bike-way known as Better Naito. Not only is it faster, but I also like to check out Mill Ends Park to see if there has been any alterations to the world’s smallest (and ever evolving) city park. From there it is an easy cruise into Old Town. For the obligatory end of the bike ride beer, there is no better place than a beer bar in a bike shop. So I pop into Cycle Portland for a Pint at the Handle Bar. So ends the Springwater Trail bike ride. Check out the map at the top or our City Guides for more information on Portland bike rides.